I have been on this path of self-discovery for some time now, and in my journey, I have tried a lot of different supplies. It’s actually one of the best things about diving into the world of journaling, especially for a pen and paper junkie like myself. But let’s be honest — it can be extremely daunting trying to figure out what supplies to spend your hard-earned cash on. No one wants to sink their money in a bad set of pens or a crappy notebook. I want to help you cut out the hard part of getting started and let you in on my favorite supplies that I’ve used over the years. Let me walk you through my top choices for the best bullet journal supplies. The bullet journal is what started it all for me. My first humble bullet journal helped me establish roots that led to brush lettering and watercolor journaling in a way that I never imagined. It just seems right to start with bullet journal supplies before moving on to anything else. To make this less overwhelming, I’m going to separate out the bullet journal supplies into two categories: beginner supplies and advanced supplies. When you begin your very first bullet journal, you truly only need a notebook and a pencil/pen. You can make it as simple and utilitarian as you want — or use that single pen to make some doodle magic. It’s totally your call. But you might want to invest a little bit in your productivity and organization, and something as simple as a small set of pens or a minor notebook upgrade can really make a huge difference. I know it did for me! That being said, don’t feel compelled to buy all the bullet journal supplies you see before you. I know it’s tempting. Instead, try picking out one or two things at a time and growing your bullet journal supplies over a period of time. The notebook is the foundation of your whole bullet journal operation, so I would highly suggest you get a notebook that you love. Don’t spend so much money that you’re afraid of writing in the journal and wasting the pages — after all, those pages are there for you to write in. So find a notebook that is a balance of economic and luxurious. This is hands down my favorite bullet journal notebook. 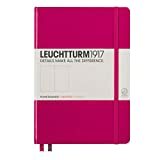 I’ve tried other notebooks that I enjoy, but I come back to the Leuchtturm again and again. Grab the dot grid for a bit of subtle structure that allows a ton of freedom, unlike a ruled notebook. One thing I especially love about the Leuchtturm is that you can use watercolors lightly in them! Check out my bullet journal watercolor test to see for yourself. And if the A5 size isn’t your cup of tea, you can grab a Leuchtturm A6 or B5, which provide an excellent range of sizes. The Moleskine line of notebooks is another great place to turn for your bullet journal. Their softcover and slim profile make them a great notebook to slip in your bag and take on the go. And you can also use watercolors in the Moleskine if you wish, though their paper is a hair thinner than the paper of the Leuchtturm. The Rhodiarama notebook is yet another excellent option for the beginner bullet journal. The notebook has a softcover with a lovely texture and it’s available in many colors. And the paper is a dream to write on, especially if you’re a fan of juicier pens. The notebook might be the foundation for your bullet journal, but the pens you use can impact your use of the bullet journal just as deeply. It’s important to use a writing utensil that you don’t hate. If you’re trying to use a crusty old pen that you got from your banker’s desk, it will likely not add joy to the process of using your bullet journal. Instead, opt for one pen or a set of pens that are nice to use — this will make it easier to use your bullet journal more regularly, which is imperative as you develop the habit. Is it a pen? No, technically. But is it useful? Yes! I love these cheap pencils for laying out spreads before I use ink or simply for doodling. They’ve been my go-to pencil since high school. Looking for a nice set of black pens? These Microns will do the trick! 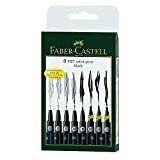 They come in a variety of nib sizes so you can get extra fine lines to more bold strokes. Mine lasted me for years of abuse, so I can personally vouch for their dependability. If you want to have some options for black pens, here’s another that I use and love. The Mono drawing pens are perfect for plain ol’ writing all the way to doodles and drawings. And they, too, come in a variety of nib sizes. Sometimes you just want a cheap pen on hand. If you bullet journal on the go or at work, your supplies might get lost or stolen by sticky-fingered coworkers. But you don’t want to compromise on performance, do you? That’s where these G-2 Pens (or their Pilot Precise cousins) come into play. They come in black as well as a variety of colors, and their ink is quite satisfying to lay out on the page. A major problem that many beginner bullet journalers face is the fear of making mistakes. It’s one that can be overwhelming and lead to a delay or outright halt of progress. 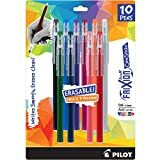 If that’s something that worries you, then I would suggest the erasable Pilot FriXion pens. With an erasable pen, you might spend less time worrying about mistakes and more time writing. If color is the name of your game, then consider this fineliner set. As the name implies, they indeed have very fine lines. And their range of colors is incredible and crisp on the page. 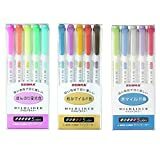 These pens are excellent for taking color coded notes or for simple doodling. Personally, I love the feel of a felt tip pen. I just love the way they write. 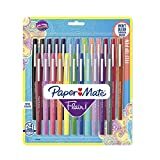 That’s why I’m throwing this set of Paper Mate Flair pens on the list — some people might prefer a colorful set of pens with that unbeatable felt tip feeling. You need highlighters for your bullet journal, right? Look no further than these Zebra Mildliners. I was never a big fan of highlighters until I found this brand, but after using them, I became a convert. Most highlighter sets have the same screaming neon colors, but Zebra comes at you with softer hues. You can get pastels, jewel tones, and earth tones — which to me is a million times better than neon yellow. Check out my review of the Zebra Mildliners. 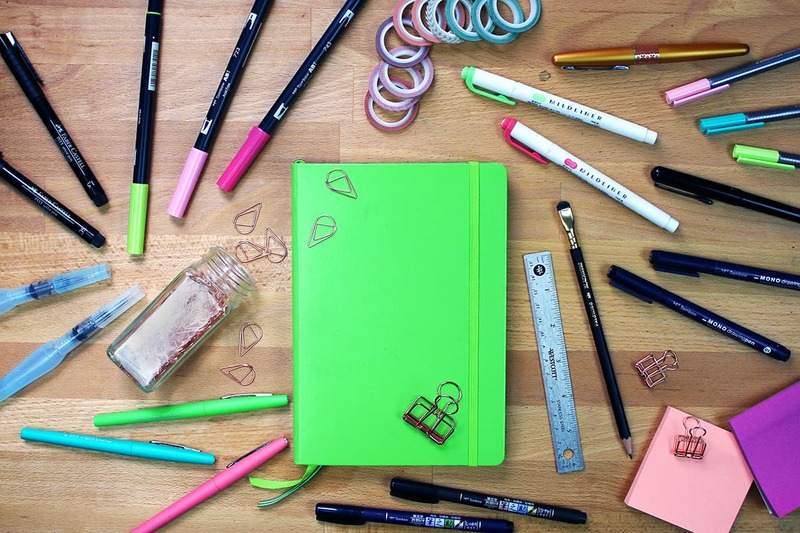 Besides the obvious bullet journal supplies of a notebook and pens, there are a few other items that you might want to pick up to make your experience fun. These are by no mean necessary, but they might make your bullet journal easier to create or just more enjoyable! When you’re first beginning your bullet journal, you might want to lean on bullet journal printables every once in a while to let you focus on other aspects of your planning. That’s totally fine! If that sounds like something you’d like to do, I’ve got you covered with the free bullet journal printables available in the Fox Den Resource Library. Just subscribe to my email list and the printables are yours! 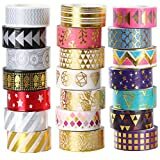 There is something intoxicating about washi tape. The ability to add colorful flair and design to your bullet journal with a snap of your fingers (or nearly) is pretty amazing. And washi tape comes in an infinite varity of colors, textures, patterns, and sizes, so there really is something for everyone. A word of warning, though: you may become addicted and collected a thousand washi tapes. Beware. I can’t count the number of times that a ruler has come in handy for my bullet journal. It’s just one of those things that can make or break a spread, and it’s invaluable to have one in my pencil bag. I personally love one with a cork back so it doesn’t slip while I’m using it. 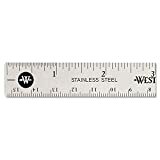 Westcott 10414 Stainless Steel Office Ruler With Non Slip Cork Base, 6"
Nearly indestructible stainless steel. Attractive finish. Speaking of a pencil bag, this little pouch makes traveling with your bullet journal a million times easier. Keeping a bunch of pens rattling around in your purse or backpack isn’t ideal — for you or the longevity of the pens. If you’ve been using your bullet journal for a while and you feel like you have a solid grasp on the basics, then you are probably ready to step up your game. There are a ton of handy bullet journal supplies that might overwhelm a beginner but are perfect for someone more advanced in the bullet journal world. 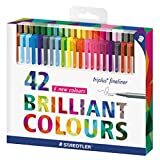 As you use your bullet journal more and get to understand your best use of the system, you will have a better idea of which of the supplies listed below are right for you. ‣ 7 Reasons to Start A Bullet Journal in 2019. ‣ 6 Creative Hobbies to Try in 2019. ‣ Journal Prompts to Inspire You in 2019. 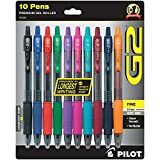 There are a ton of incredible pens and markers out there that are begging to be used in a bullet journal. Each of the materials listed here is tried and true, but it’s up to you to figure out which ones are right for your style. Ever been curious about using a fountain pen? The Pilot Metropolitan is an excellent jump into the world of fountain pens, and it’s quite affordable, too. This pen is a joy to write with and will make you excited to pick up your pen and use your bullet journal. Like I said earlier, bullet journaling was the catalyst I needed to start my love of brush lettering. 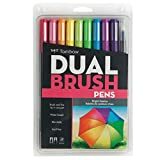 If you want to incorporate lettering into your notebook, then these Dual Brush Pens are a must-have. You can also use them for highlighting and adding all kinds of decoration to your bullet journal! This is one of those pens that I will likely never, ever stop buying. I love these pens. 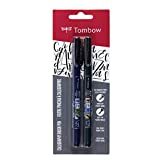 They are very fine brush pens, making them perfect for the narrow corridors of a bullet journal. I love using them for drawing, lettering, creating spreads and boxes, and so much more. They are beloved to me. 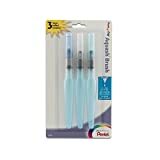 If you want to dabble in watercolors in your bullet journal, then the Pentel Aquash Brush Pens are perfect for you. They make it incredibly easy to splash some color on the page without a whole lot of fuss. And lots of notebooks handle it better than you might imagine. Check out these four easy watercolor techniques to use in your bullet journal for some inspiration! Whether you like brush lettering or not, I’d still recommend this brush pen. It packs a huge punch with its bold, black color and flexible brush tip. I have used it for years in setting up my spreads because I love the variation in line width and texture that it produces. I’ve had these for a long time, and I still use them after all these years. When I got the Staedtler set I fully expected to stop using these, but I just keep coming back. I can’t really quantify what I like about these markers, but I just love the way they write. Prismacolor is just really good at what they do. This pack of pens has a huge level of variety that I just love. There are drawing pens, different brush pens, and even a fat bullet tip pen. If you want to try out brush pens without committing to a whole set, this is the option for you. 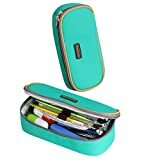 Perfect for drawing on the go! These random bits and bobs are definitely a little bit extra, but you might find something that you absolutely cannot bullet journal without. When you’re trying to create a circle for a spread, like a Level 10 Life chart, it can take forever. Even if you’re using a dot grid notebook, the process isn’t what I’d call easy. Grab yourself this affordable circle maker, though, and you’ll be whipping out circles all day long without breaking a sweat. I love using Post It Notes in my bullet journal. Sometimes I use them to jot down a thought or a plan before I properly organize it on the page. Sometimes I use them as a reminder, moving the note from page to page until I get a task done. Other times, I use them for extra information that couldn’t fit onto a page. One way for another, Post Its have been incredibly useful to me over the years. Want to add a bit of character to the cover of your bullet journal? Grab a set of your favorite vinyl stickers from my shop and you can make your planner uniquely yours! 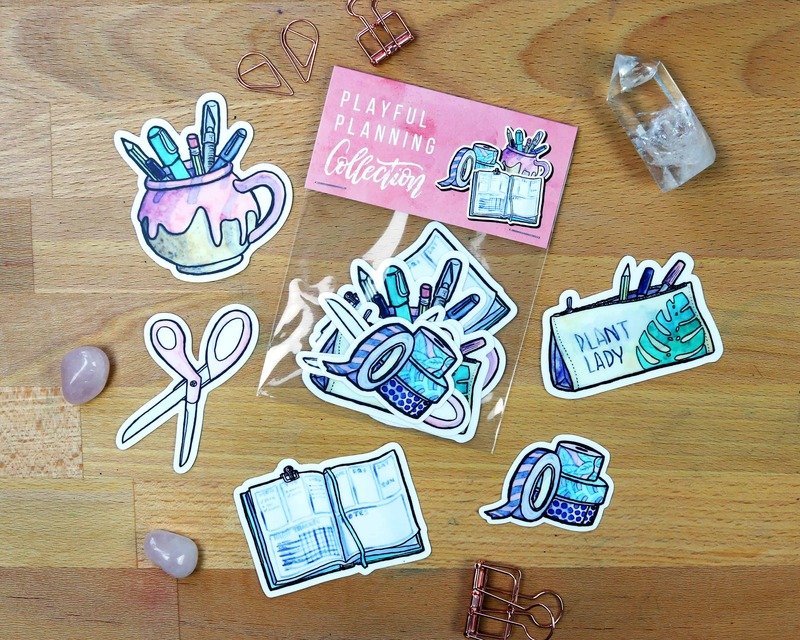 Stickers for your Bullet Journal, Planner, or Laptop Adorable vinyl stickers to give your life some extra color and sass! I took ages to finally buy a set of paper/binder clips, but now that I have them, I use them every day. Save yourself the annoyance and frustration and just grab a cute set of clips. You’ll thank yourself later. 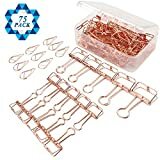 Package includes: 10 small binder clips,5 medium binder clips and 60 pcs drop paper clips. The product made of high quality steel wire with good elasticity. Assorted Size: 5pcs M ( 32mm wide) and 10 pcs S (19mm wide) and 60 pcs paper clips. 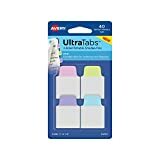 If you like to tab your pages, then you will love Avery’s line of Ultra Tabs. They are incredibly durable, come in a ton of cute patterns, colors, and shapes, and are smudge resistant. I was super impressed by this line of tabs, and you will be, too. Durable and repositionable tabs. Sturdy page flags stick securely and hold strong enough to turn pages, but remove easily for quick changes. Are you a fan of taping things into your bullet journal? 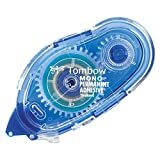 Then grab one of these Tombow adhesive tapes. They rock. You can slip one into your pencil bag and keep in on the go to paste in quotes, pictures, doodles, and everything else your heart desires. Safe to use on paper, photos, cardstock, etc. Want to read some great books to help you organize your life and make a better use of your bullet journal? Here are a few excellent choices to get you going. And if you don’t have time to sit down and read, give Audible a try! You can listen to books on your commute to work, while you’re doing chores around your house, or while you chill in the bathtub. It’s a great option for people with packed schedules, and you can try it for 30 days free and get 2 free audiobooks just to test it out! Just head here to sign up for a trial and see if it rocks your world. This book gives some fantastic techniques to maximize your mornings and develop killer habits. In fact, the Level 10 Life technique comes straight from this book, so you know it’s packed full of awesomeness! This book might not be about journaling, per se, but many people in the bullet journal community have found it incredibly helfpul for organizing their lives in general. The bullet journal can help you organize your mind, and this book can help you organize your physical space so you can achieve balance! Want a book written by a member of the bullet journal community? Look no further! Megan from Page Flutter penned this awesome book chalk full of insipiration and bullet journal eye candy. There’s even a little mention of me in there! While I hope you find this list of bullet journal supplies helpful, I just want to remind you that you don’t need a ton of stuff to have a successful bullet journal. What you need is some way to make the process enjoyable — whether that means using nice supplies, drinking a hot cup of coffee while you write, or listing to your favorite music, it doesn’t matter. Don’t feel like you need to spend a ton of money on a huge collection of supplies in order to get the most out of your bullet journal. But don’t be afraid to indulge yourself a little either! If you can strike a nice balance with your supplies, you will find that your bullet journal system will develop nicely and you will love the process. Now go out there and rock your bullet journal! ‣ The Ultimate Hand Lettering Guide for Beginners. ‣ 5 Bullet Journal Supplies Under $5. ‣ The Best Watercolor Supplies for Beginners.